Qi (or Chi pronounced chee) is often referred to as �the breath of life.� It is our body�s �life force� or �vital energy� traveling along pathways or channels called meridians. For centuries the Chinese have used acupuncture needles to unblock and balance this energy flow. Smoothly flowing Qi is the key to achieving and maintaining physical and mental health. While Acupuncture is a form of energy medicine for our body, feng shui is energy medicine for our environment and our life. In Chinese feng (pronounced fung) means wind and shui (pronounced schway) means water. You already know that water is the sustainer of all life, whether plant, animal or human. Likewise, it is the wind that carries water from place to place, causes evaporation from the sea, and enables rain to fall. Wind and water are therefore essential to our survival. These elements also carry the invisible life force energy called Qi. The main purpose of feng shui is to map the flow of Qi and its effect on our environment � your land, your home and office. This in turn affects your life, your career, knowledge, health and family, wealth, fame, relationships, children, and helpful people are each greatly effected by the ease with which Qi moves through your physical space. These areas are known as the �eight aspirations,� or directions of the PaKua (or BaGua). 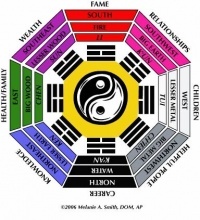 The BaGua (pronounced bahg-wah) is an eight-sided figure that is divided into eight sectors or compass directions � north, south, east, west, southwest, southeast, northwest and northeast. Each of the eight sectors corresponds to an area in your life, a direction, and one of the traditional Chinese medicine�s five elements: water, wood, fire, earth and metal. Do you find yourself always battling against life, your surroundings, your personal relationships or your career? Does it seem that your finances are never enough? Are you dealing with a personal health crisis? Feng Shui could be just what you�re looking for. Clearing your clutter and organizing your space are prerequisites to a feng shui consultation. Imagine a feng shui practitioner moving your furniture, suggesting color themes or fabrics, correctly placing a �cure� such as a mirror or a wind-chime and finding suddenly everything seems to go your way. The most unexpected meetings develop into profitable business relationships or a promotion. Co-workers suddenly seem more helpful and you feel more in control of your life. It can happen to you! Over many centuries different schools of feng shui have developed. Each school has a slightly different approach, although the basic principles remain the same. Form School focuses predominantly on the contours of physical landscapes - their shapes, size, water courses, and the relationship between the physical formations and a dwelling. The four directions are symbolized by four animals: East relates to the green dragon, the West the white tiger, the South the red phoenix and the North is the black turtle. Nestled between these you can find the most auspicious location for a house. Traditional Chinese Compass School originated in China over 3,000 years ago. This school uses the Eight Trigrams of the I Ching, the Chinese book of Divination, the eight-sided PaKua symbol, and the Lo Shu magic square (used to divide up the space into nine sectors). These tools are used to diagnose the Feng Shui quality of locations and the Qi flow coming from different directions. The career sector of the PaKua is always oriented to magnetic North. Black Sect Tantric Buddhism (BTB) originated in China and was introduced into this country over three decades ago by Grandmaster Professor Lin Yun. It refers to the Eight Trigrams as the BaGua and is based on a more spiritual approach. The North or career sector of the BaGua is always positioned over the main door of the house or room. The BaGua is the most basic Feng Shui tool. Once you have identified where each of the Eight Aspirations are located in your home, you can then energize them using a number of different cures and enhancements to stimulate positive Qi flow and create good Feng Shui. In a similar way, good health is often a question of getting the balance right in various aspects of your life, but having good health is the best basis from which to improve and expand your life in all areas. In the I Ching, Chen stands for Spring or new beginning and is the trigram for Health on the BaGua. Health is located on the East side of the BaGua with Big Wood as its Element and the color of deep green. The Chinese have forever been in search of the elixir of life, creating natural herbal decoctions for medicinal use. Chinese legends and stories abound with tales of emperors sending emissaries to seek for the secret of immortality in far off places. Even the ingredients in Chinese cuisine are combined to balance yin and yang qualities of food. The whole concept of health is to keep the Qi balanced and moving inside the body. Stagnated Qi gives rise to illness and when Qi leaves the body altogether, death occurs. Hence, the Chinese development of various martial arts like Qi Gong (see Acufinder the Magazine - Spring, 2007) and Tai Chi, which use correct breathing techniques to improve circulation and prevent blockages of Qi within the body. The vital organs in the body are also linked to the Five Elements. The kidneys are associated with Water, the liver with Wood, the heart with Fire, Spleen with Earth, and the lungs with Metal. To activate the Health area, concentrate on the East sector of your house, room or garden. Good Feng Shui in this area represents good health for the whole family. The East is associated with the Wood Element and the best method to bring Qi to this area is the placement of a healthy green plant such as bamboo. Any healthy green plant without sharp leaves will do. Avoid using cactus plants. The size of the plant should be proportional to the size of the room. Be sure to properly care for the plant keeping it watered but not over watering. An unhealthy plant, or dried flowers, will cause your Health Qi to stagnate increasing the opportunity for illness. If a live plant is out of the question, you can also use pictures of plants such as bamboo -- the symbol of strength and longevity. The use of wood furniture in this area versus metal furniture will also increase Health Qi. I�m reminded of a consultation I did with someone who had several health issues. Upon entering her space, I noticed a cat litter box in the middle of her health sector. Simply moving the litter box to another area and adding some cures such as green paint, healthy plants, crystals, and pictures representing health allowed Qi to flow and her health quickly improved. Is your health sector a spare room cluttered with boxes and junk? If so, it�s time to clear out for improved health. Feng Shui affects every aspect of our lives. Are you ready to let the wonder of Feng Shui unfold for you? Melanie Smith is a Doctor of Oriental Medicine, Acupuncture Physician, Certified Eden Energy Medicine Practitioner, Licensed Massage Therapist, and Feng Shui Consultant. Her practice Well Within Natural Medicine is located in St. Petersburg, Florida where she integrates a variety of energetic, emotional, and therapeutic bodywork techniques. Dr. Melanie is also senior faculty for Donna Eden the author of the book Energy Medicine. She travels the country speaking and teaching on The Power of Energy Medicine and is the author of the Energy Medicine for Healthy Living� series of Color Laminated Charts and DVD�s.